Available by Pre-Order Reservation only. 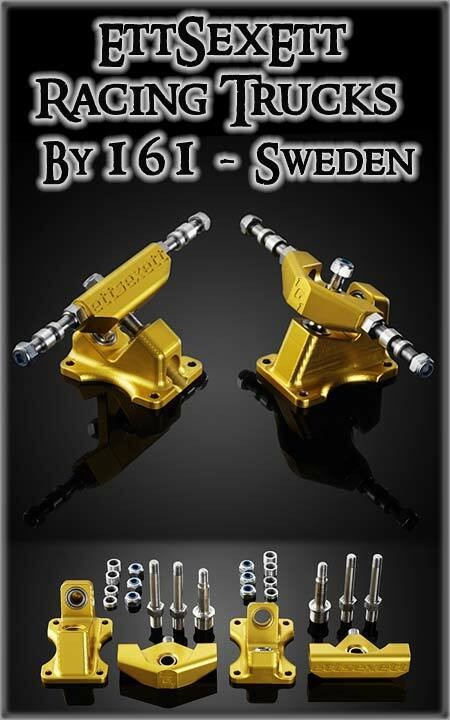 Designed specifically for slalom skateboard racing - the 161 (EttSexEtt) Trucks are manufactured in Sweden and are available by special order through Sk8Kings. This item is for a truck set - one front and one rear truck. These high performance trucks offer well thought out design aspects racers will appreciate. Premium Bushing Upgrade Option: The truck pair does not come with installed bushings but can be ordered with custom premium bushing combos to suit rider weight. We use top grade bushing stock from Riptide, Reflex and Venom - and includes beveling mod for spherical bearing fit. Choose this upgrade option when adding to cart.